The apartment was exactly like the photos. Allowed us to check in early. Had a great stay. Ideal location with fireworks on Sat. night and gorgeous views. Walking distance from ferries. Many items in the kitchen were present so we didn't have to purchase basics to make a nice meal. Owner very accommodating in letting us check out late. The view was priceless! MS. SANDRA being the wonderful host and homemaker that she is, was very insightful in preparing the place for us. There was nothing that we needed that we didn't find in the apartment. Definitely, one of our best experiences in traveling! The location is awesome, so close and convenient to the shops and other activities at Darling Harbour. Comfortable and lovely apartment overlooking the harbour, not my first visit and won't be my last! This was outstanding I was impressed and just utterly enchanted by the property Every detail catered and just sublime. I’ll be back for sure! 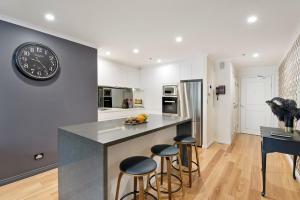 The views from the apartment are amazing , it is spacious and has everything you will need.The location could not have been better just a short walk into the CBD with cafes , restaurants and bars on the doorstep. The fireworks on a Saturday night were amazing. we would definitely stay here again. The beds were really comfy and the apartment is just as the photos show . Everything!! So covenant to everything. Beautiful place will definitely be back. Stunning, stunning, stunning View. Absolutely georgous. The balcony overlooking the Darling Harbour was just stunning and great. Having a glas of wine and Looking at the buildings and the lights. superb. The view from the apartment was fantastic, couldn't stop gazing out during the day and evening at the activity in the harbour. The beds were super comfy, kitchen was lovely and everything you need is supplied. 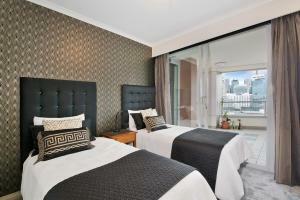 Lock in a great price for Darling Harbour Getaway – rated 9.5 by recent guests! One of our best sellers in Sydney! 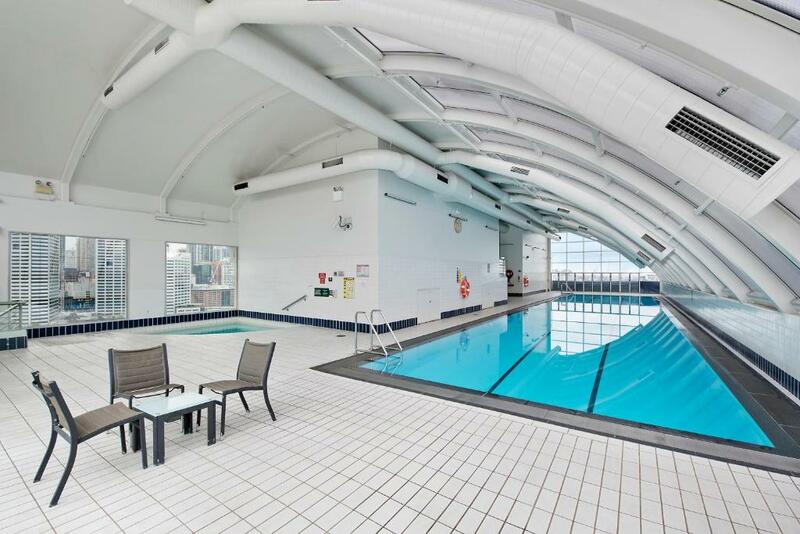 Boasting stunning views over Cockle Bay, free WiFi and an indoor pool, Darling Harbor Getaway is just 1,000 feet walk from vibrant bars and restaurants in Sydney CBD (Central Business District). Guests can enjoy a fitness center, and free secure parking. Darling Harbor Getaway Apartments is within 6 minutes’ walk of Star Casino, Sydney Convention & Exhibition Center and the Australian Maritime Museum. King Street Wharf and Chinatown are within 15 minutes’ walk. The stylish air-conditioned apartments feature a furnished balcony, a fully equipped kitchen and 2 bathrooms. Each apartment has a dining setting and a lounge area with a sofa, flat-screen TV and DVD player. 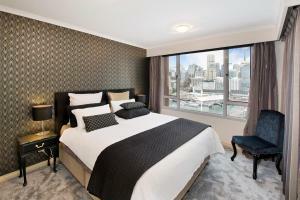 When would you like to stay at Darling Harbour Getaway? This stylish apartment features a balcony offering views of Cockle Bay. It has a full kitchen and 2 bathrooms. Secure private parking is included. Located on the 12th floor Darling Harbour Getaway is a oversized apartment, 2 large Bedrooms with seperate Bathrooms for both rooms,Fully equiped Kitchen for those wanting to eat in. Free Wifi . 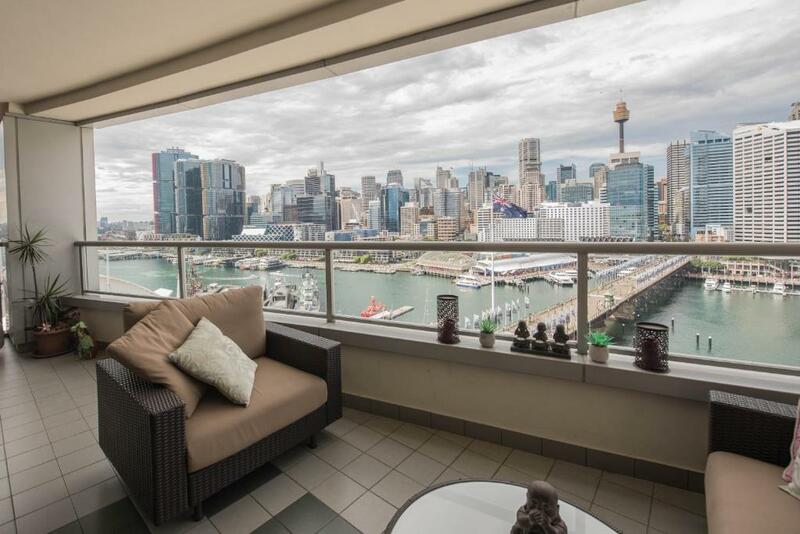 Large Balcony with direct views over Darling Harbour. BBQ also located on the Balcony. 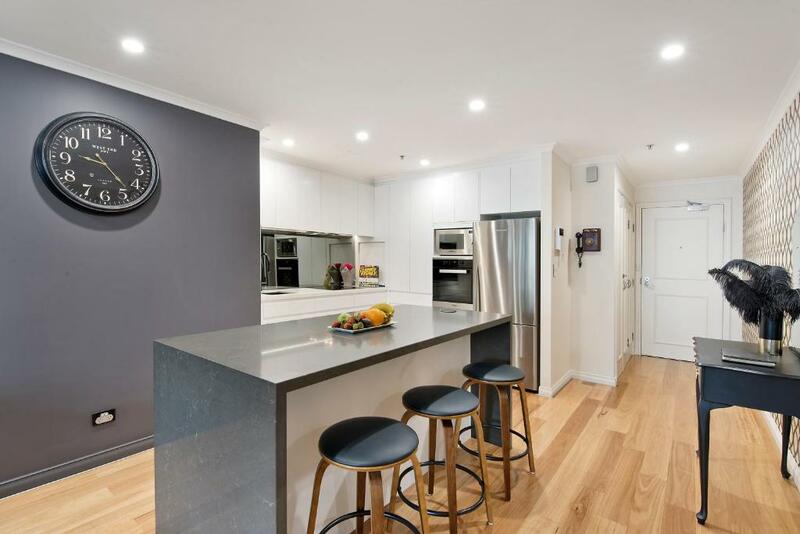 Owners Sandra and Mick purchased the property after visiting the area for some years and fitted it out to suite their personal needs , Furnishing,appliances down to the Linen is only what they would expect. The apartment has all that you would require and that little bit more . Darling Harbour is full of activities for all to enjoy, from the national Aquarium- The Maritime Museum,Chinese Gardens- great bike tracks that will take you on some of the most scenic rides - Darling Harbour Shopping Centre packed with shopping/ restaurants and it goes on and you haven't even left the doorstep. For the Business person. All your requirements from free secure parking- wireless internet- access to the business precinct within walking distance - Convention Centre -metres away - Facilities to eat in or dine out after a hard day at the office. 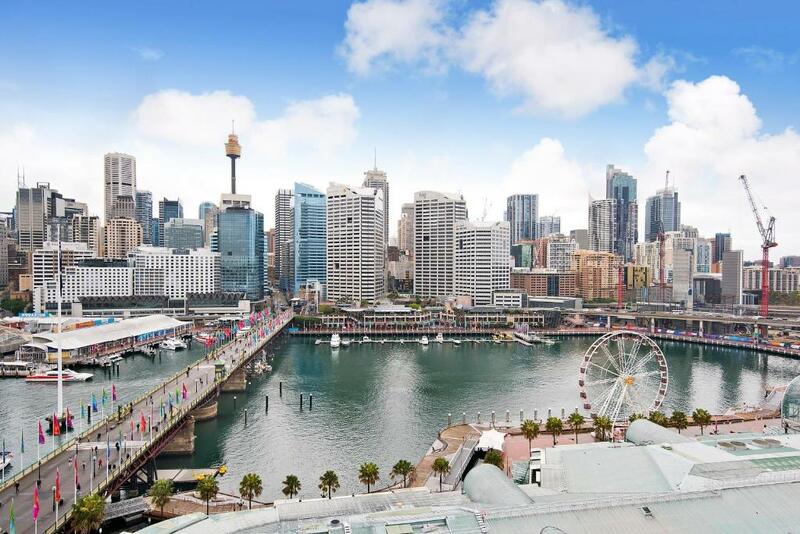 House Rules Darling Harbour Getaway takes special requests – add in the next step! Debit card Darling Harbour Getaway accepts these cards and reserves the right to temporarily hold an amount prior to arrival. Darling Harbour Getaway accepts these cards and reserves the right to temporarily hold an amount prior to arrival. Please note that Darling Harbour Getaway does not accept payments made with American Express credit cards. An absolutely fabulous apartment and location. All in excellent order, you simply want nothing more. We will certainly be having this apartment again, but, for longer duration, thanks to all concerned. The kitchen was not really clean. Some drawers were dirty. The fridge was not cleaned out either and some leftover cheese and butter full of breadcrumbs… heree is definitely room for improvement, but the stunning View made it all!!! Leaving that amazing view. There were no downsides to our stay. An awesome place to stay with everything we needed for our stay. Very convenient location for us too. Such an amazing place, would definitely recommend it & we will return. The location is perfect, the apartment is amazing and the view of Darling Harbour (particularly at night) is superb. The owners went above and beyond to accommodate us during our stay and the little extras in the apartment were such an added bonus. I will definitely stay here again. The outside noise (droning sound that never seems to stop) but we live in the country, so for us it was noticeable but never spoilt our time there.. The second bedroom was quite small plus had single beds and when I booked I thought both rooms actually showed with double or queen beds. The location was perfect, exactly what I wanted for us. The apartment lovely a spacious, tastefully decorated. loved the spacious balconey. 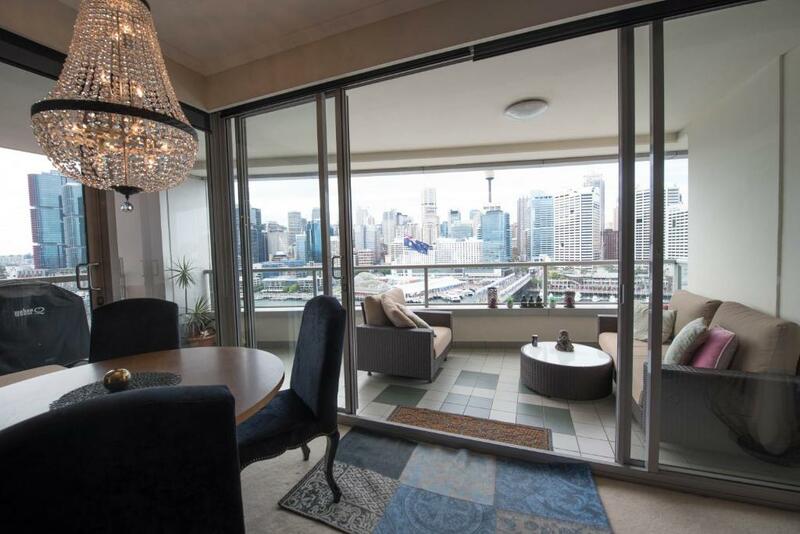 The apartment had everything we needed, was extremely comfortable, ideally placed for sightseeing, and the views over Darling Harbour were stunning. The fabulous location is always winner for me + the comfort and cleanliness of the apartment. It's the little things too ie: I don't have to pack shampoo and the availability of some kitchen food on arrival make it so much more hospitable. 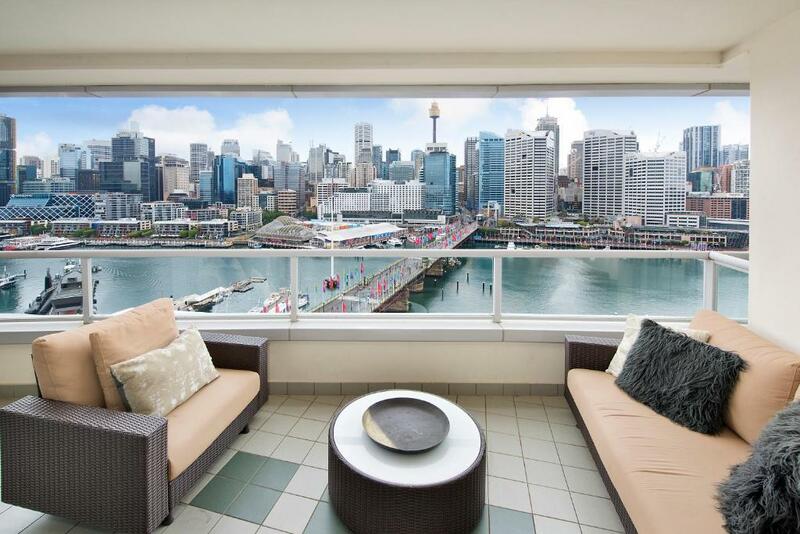 I always try the availability of this apartment first when planning a trip to Sydney, it's my favourite. It's good on the whole. A cosy apartment with thoughtful additions here and there (eg toiletries, utensils). The view from balcony is superb! Location is good with Maritime Museum and shopping mall located just below the apartment. Supermarket (Coles) is just a few minutes walk away.